Gone are the days of traditional being a stale and dusty word. With new ideas incorporating the intricate designs, bold choices and rich tones of traditional design, more and more people are finding a new found fondness for this luxurious and stylish décor. So how can you incorporate traditional décor within your home without it looking old-fashioned and out-dated? Adding a piece to your room incorporating a traditional design will go a long way towards creating your style. 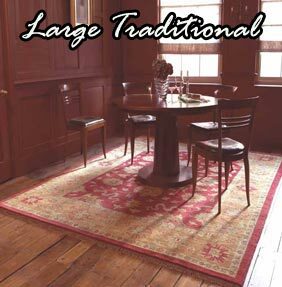 An excellent and affordable way to do this is to buy a large traditional rug. A rug will cover a large area and will act as the foundation for your room’s décor. Choosing a traditional colour and tone for your interior can be very exciting. Most tones are rich and deep, rather than bright and vivid. If you have dark, hardwood floors or wooden beams in your home, the deep reds and oranges of the traditional style will suit it perfectly. If you are creating a space in your chosen colour by adding a large rug then adding accessories to this space will create an even more effective atmosphere. Choose your accent colour and buy accessories in that tone. Searching specialist stores and even antiques fairs will help you find exactly what you are looking for. Creating a traditional space using both old and new pieces is becoming more and more popular; so go and create yours today!